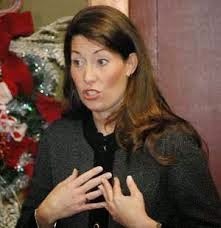 FLORENCE, Ky. (AP) — The Democratic Senatorial Campaign Committee has stopped running TV ads in Kentucky’s U.S. Senate race, a troublesome sign for Alison Lundergan Grimes in her challenge of Republican leader Mitch McConnell. In a statement, the committee says it has spent more than $2 million in Kentucky and is still funding get-out-the-vote operations. The committee says it will continue to monitor the race, but it has made no commitment to go back on the air in support of Grimes, who has been pummeled by tens of millions of dollars in attack ads by McConnell and his allies. The Democratic committee continues to spend heavily in other competitive races in Arkansas, Colorado, Georgia and elsewhere as it tries to prevent Republicans from winning a Senate majority.